I can honestly see why the chihuahua would have hated it! That is A LOT of snow! I wouldn't like it if I was a chihuahua either! It's taller than he is! You, my friend have a lot of snow. Stay warm and safe! thanks so much for taking the time to leave a comment over at my blog yesterday. I hope you have an enjoyable end to the week and are able to shovel yourself out of all that snow! 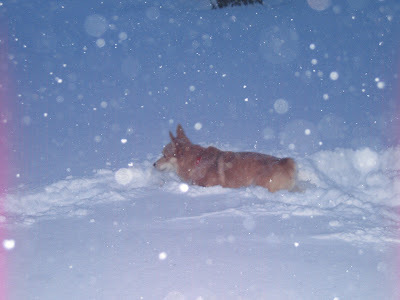 Oh wow, that is such an amazing shot ... knee deep snow is always awesome ... at least for him it's knee deep.